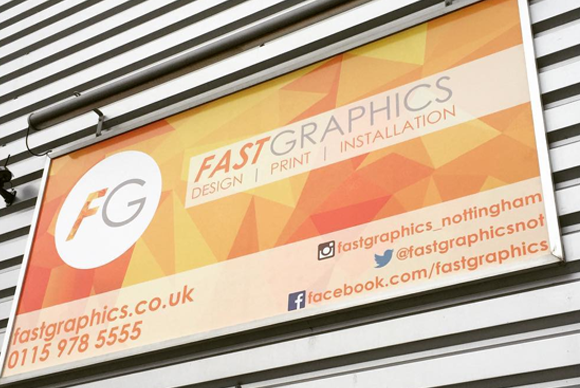 Fast Graphics was created by Tony Bates in 2003, the intention from day one being to build a bluechip client base by forming a close working relationship, understanding requirements and delivering exceptional service. He was able learn from and build on five years previous experience holding the Nottingham contract for a national sign making franchise in addition to many years in business and marketing management. Now boasting a first class team we love a challenge and never say no (well, almost never!). We have worked on some huge projects, always delivering on time and in budget, going that extra mile to ensure the end result is outstanding. Supported by cutting-edge equipment, our own cherrypicker, a host of health and safety and other accreditation. Our product range is vast, some of which are listed below. We have also worked on a wide variety of major projects, such as national and international sporting events.